I'll add more descriptive items in the next few days, however as Spring approaches as well as my 67th birthday, it's time to part with my cherished gem, as climbing in and out ain't like it used to be, and the horizontal slide into the wife's Lexus RX is much more doable as I gracefully mature into an old fart. Anyway, I got this car when I turned 60 in 2011, and it had 42k miles. As of today, it has 65,500 miles. Base Boxster, 5 speed manual, A1 Black. I've performed gobs and gobs of maintenance, updates, required or not. At 51,310, IMS bearing update, new clutch, pressure plate, throw out bearing, crank seal, rear main seal, cam cover seal, new engine mounts, transmission mounts, (ALL that was done PROACTIVELY so I could sleep at nights) hydraulic valve, hydraulic actuator, new Michelin Pilot Super Sports on rear at 54,035 mi., new Michelin Pilot Super Sports on front at 62,599 mi, balance, alignment, etc. at 62,599 mi., new water pump, thermostat, serpentine belt and new coolant (w/flush) at 63,866 mi, synthetic oil, filter, lube, etc., done every 3-5k miles. Hard top, clear bra (hood, fenders, bumper), new battery, new heater core, chrome tips for exhaust, new Vertex rear track arms with special bushings. Aluminum console, carbon fiber shifter knob, Bose sound system, new ignition electrical switch....all the good stuff, fixed, perfect. I am a perfectionist, and I want reliability, no stress, at any cost. So, for a $25k car I got in 2011, 7 years later I've spent over $10K in maintenance, updates, service, add-ons, etc. Interior with black leather and red stitching. This is a beaut. Absolutely nothing wrong with the car, actually just took it to inspection today. Never sees snow, very little rain. Oldwick Village Garage in Oldwick and Bodymotion in Ocean, NJ are the only persons I trust and did the work. If interested, please PM to arrange your mechanic or whomever to inspect. I'm pretty firm at $14k considering the quality of the car, condition, maintenance, etc., and respect my honesty regarding the upkeep. I am a fusspot, and the car looks like new, drives like new and is an adult driven sports car. Sure, I take exit ramps at 85 MPH, but that's what a low hugger mid-engine Boxster driver is supposed to do to keep the electricity flowing in the veins, right? The latest Excellence Magazine May 2018 Market Update has the 2003-2004 Base Boxster at $10,000 for Average, $12,500 for Good and $15,000 for Excellent condition. Your $14,000 asking price seems dead on considering the condition and everything you have done. PS, I turn 64 next month, I hope I am still okay to enter and exit my Boxster when 67 rolls around! Not to clutter up your for sale post with comments, but at first glance I thought that it was over-priced for a base model. After reading through the care and maintenance, plus all the extras it looks like a great deal for the future owner. Beautiful car, driven enough and pampered with all the right extras. GLWS. beautiful car! are those the stock wheels on it? look like 996 Turbo/4S wheels but i thought the widths/offsets were not right for a 986. Also, was it an LN Engineering IMS bearing installed? 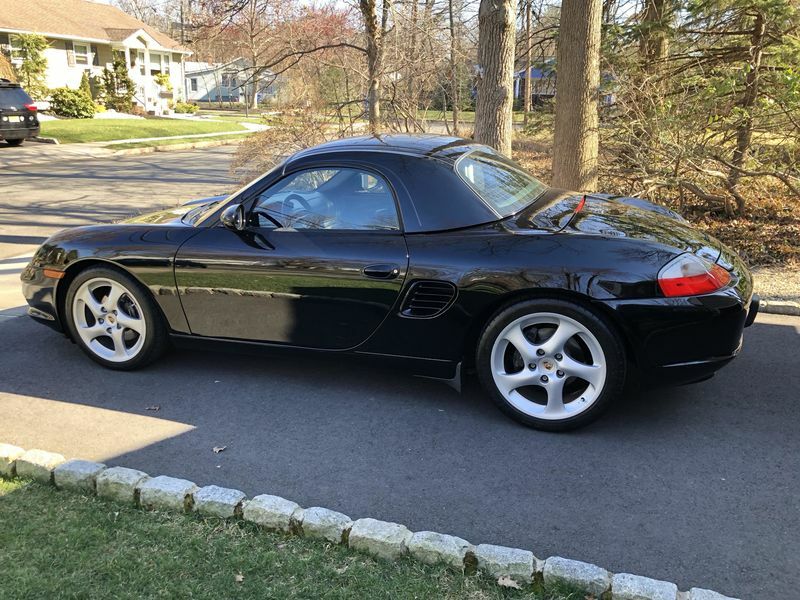 You are making me consider "upgrading" my 97', love the black with the hardtop it just looks SOOO GOOD! Additionally, factory OEM aluminum console and carbon fiber shift knob! I wish everybody would post ads like yours. Well written and informative. Good luck! Last edited by Sdm3; 04-10-2018 at 11:40 AM. "I was really interested in it man. What did you get for it?" Just reply by saying "Until the title is transferred, you're more than welcome to make an offer to see what I'll still accept. Afterwards you'll have to ask the buyer what they paid."